A sneak peak of the choir performing at Britain's Prince Harry and Meghan Markle's wedding this weekend has been released. The choir of St. George's Chapel released footage of their rehearsals ahead of the royal wedding on Saturday. Two of the choir's youngest members, Leo Mills (11) and Nathan Mcharo (9) said they were "very excited" to perform in front of the royal family. "I'm really excited because I'm really lucky because not many people get to sing in such a special event," 9-year-old Nathan said. "I mean it's a once in a lifetime opportunity. If it's handed to you, you take it, you don't shy away from it," said Leo. 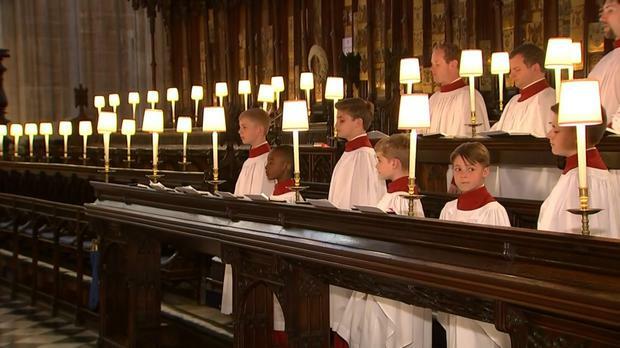 The two boys are among 12 young choristers singing at the wedding. The choristers are from St. George's School on the grounds of Windsor Castle, where they sing up to 8 services a week. "I've got a bit of nerves but that's alright because we're confident," Nathan said. Leo added that: "It's really nice [to be part of a big group], it'd be harder if it was just four or five of us but there are 12 of us so it's a lot easier." The royal wedding will see a British prince marry an American actress in the historic surroundings of Windsor Castle's St George's Chapel. Meghan and Harry are keeping to tradition by spending the night before their wedding apart. The bride will be at the Cliveden House Hotel, set in a National Trust estate in Taplow, Berkshire, with her mother Doria. Harry will be with William 15 miles away at the Dorchester Collection's Coworth Park in Ascot. The congregation will start arriving from 9.30am and the royals from 11.20am. The service begins at 12pm and the newlyweds will emerge from the chapel at 1pm.